From Martha Stewart to Glamour magazine I’ve seen the neon color trend utilized on everything including party themes to head-to-toe fashions. Although I personally wouldn’t be caught dead wearing a neon dress (it would attract WAY too much attention AND I am WAY too old to pull it off), I do however find electric blue and hot pink youthful and playful. What’s even better about neon is that my daughter is extremely attracted to these cheerful colors so I thought I’d do a fun kids craft with her. I came across AstroBrights papers, which was PERFECT for the project I had in mind, a) because of the unique and vibrant neon colors, and b) because Astrobrights supports a great cause that I believe in (more later). 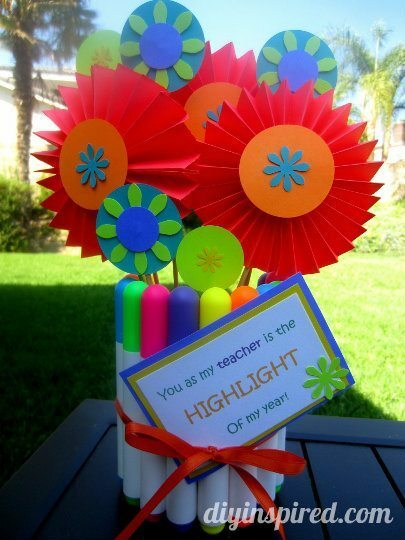 I wanted to make a unique back to school teacher gift so I bought a set of highlighters that scream neon and decided to make a paper flower bouquet to present it. Here are the materials you need to make this Back to School Teacher Gift. Remove the label, wash, clean, and dry a recycled can. Next wrap a rubber band around the can. One by one, add your highlighters around the can. Tie a ribbon around the can to hide the rubber band. Insert a small piece of Styrofoam or floral foam inside the can. Set the vase aside. Constructing paper flowers can be made however your heart desires. For this project, I made simple accordion flowers. With my daughter’s help, we used craft punches in flower and circle shapes to embellish the accordion flowers. We hot glued each paper flower onto a wooden skewer and arranged them in our highlighter vase. 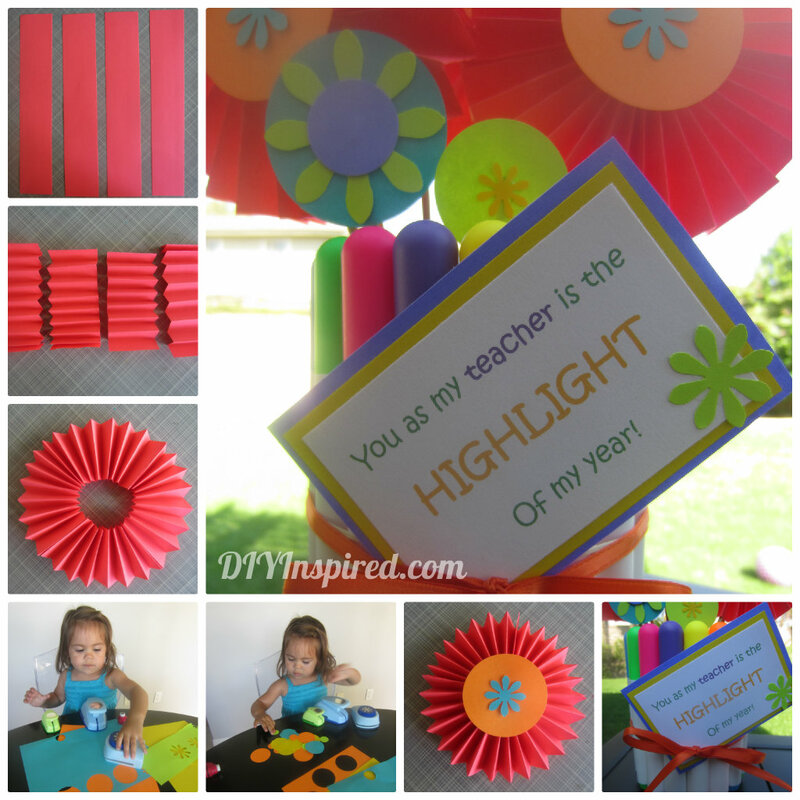 Using my computer, I made a sign that says, “You as my teacher is the highlight of my year.” A had written note from your child is a great option too. Win school supplies worth $30,000 for the elementary school of your choice!!! This exciting campaign is going on now and will run through September 10, 2012. Simply “like” AstroBrights Facebook page and submit a short online form to be entered into the sweepstakes. You can then earn additional entries every week by revisiting the page and answering a few simple questions. In addition, enter the Make something Astrobrights challenge to win a Visa Gift card. 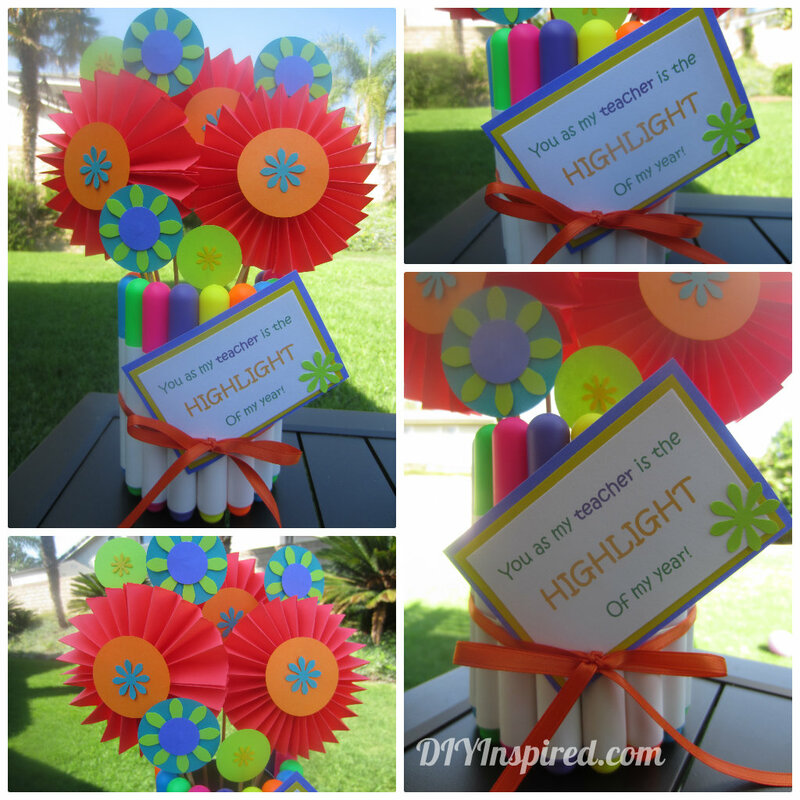 Submit and share ideas like this one that are so bright they’re AstroBrights! Check out AstroBrights on Facebook for more details! Here are some more AFTER photos! So clever & cute! Can also see the possibilities of using this same concept with colored pencils or peppermint sticks (for Christmas)!